Dan Morgan reported in this morning’s Washington Post that, “Thanks to the application of a little last-minute budgetary magic, the farm bill before the Senate this week authorizes about $10 billion in new subsidies, price guarantees and disaster aid in the next decade, even as farmers report near-record profits. “Few predicted that outcome a few months ago,” the article said. More specifically, regarding the Average Crop Revenue program proposal, the Post article explained that, “Farmers choosing the program, which would start in 2010, would no longer be eligible for traditional farm subsidies. But budget officials predict that tens of thousands of farmers growing corn, wheat or soybeans will opt for it because traditional payments stand to be sharply reduced in coming years because of higher commodity prices. “The plan is backed by the National Corn Growers Association and is sponsored by Sens. Richard J. Durbin (D-Ill.), Sherrod Brown (D-Ohio) and [Ag Committee Chairman Tom Harkin (D-Iowa)]. “In a Nov. 1 estimate, the Congressional Budget Office (CBO) determined that the program would reduce government costs by $2.4 billion between 2008 and Sept. 30, 2017 — the official window for judging whether a program conforms to the pay-as-you-go budget rules. “Those savings would occur because farmers enrolling would forgo traditional federal price guarantees and direct payments during the budget window. Concluding, Mr. Morgan pointed out that, “Last week, Sen. Saxby Chambliss (Ga.), ranking Republican on the Agriculture Committee, fired back at critics of farm program spending, noting that commodity programs now claim only a 14 percent share of the $288 billion Senate bill, half the share of five years ago. “‘There is a significant reform just in terms of pure dollars,’ he said. Meanwhile, Congressional Quarterly writer Adrianne Kroepsch reported on Friday that, “The Senate returns to the farm bill Tuesday, with Democrats and Republicans at loggerheads over how to handle the amendment process. “Consideration of the $288 billion measure stalled a week ago, after Majority Leader Harry Reid, D-Nev., said amendments would have to be germane to the bill. Republicans protested by holding up debate. “Reid then asked Republicans to prioritize their non-germane amendments, and aides said a list was circulating by the end of the week. Those proposals would be in addition to the nearly 100 farm-related amendments already filed. Mr. Clayton stated that, “Grassley and Sen. Byron Dorgan, D-N.D., have proposed changing farm payments by establishing a hard cap of $250,000 in the Senate farm bill. The current version of the farm bill would cap direct payments at $40,000 and counter-cyclical payments at $60,000 while getting rid of the three-entity rule. The main difference, however, is that the current bill proposal would allow unlimited marketing-loan gains. Grassley and Dorgan would cap those marketing-loan gains at $150,000 per farm. Brownfield’s Tom Steever noted yesterday that some farm organizations are expressing concern about the slow pace of the legislative process on the Farm Bill. Mr. Steever reported that, “The waning Congressional session is causing unease for soybean growers. American Soybean Association CEO Steve Censky is anxious for disputes to be cleared up over which farm bill amendments will be ruled in order. Joseph Morton reported in today’s Omaha World Herald that, “Sen. Ben Nelson, D-Neb., and other lawmakers are pushing to expand production of ethanol, even as some critics sharpen their attacks on the unintended consequences of the biofuels boom. “Nelson, Sen. John Thune, R-S.D., and Sen. Pete Domenici, R-N.M., have introduced an amendment to the pending farm bill that would raise the required use of renewable fuels. “The new, higher federal requirements could help keep the boom going,” the article said. 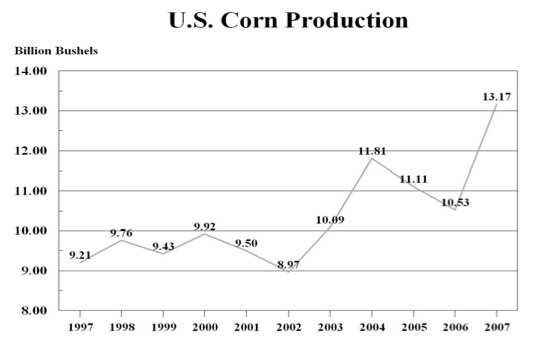 Mr. Morton added that, “About 24 percent of this year’s U.S. corn crop is expected to be used for ethanol. That represents an increase from the 20 percent last year. But total corn production is forecast to rise from about 10.5 billion bushels last year to a record 13.3 billion bushels. “Corn not used for biofuel production goes directly to food, is turned into food additives such as high-fructose corn syrup or is fed to livestock that eventually winds up on someone’s dinner plate, said Jerry Norton, a grain analyst at the World Agricultural Outlook Board. In a related article regarding the sharpened attacks on corn-based ethanol production, Lauren Etter reported in today’s Wall Street Journal that, “A coalition of world ethanol-industry leaders called on the United Nations yesterday to disavow ‘rogue’ and ‘apocalyptic’ statements made recently by one of its representatives. A copy of the letter that the consortium sent to the UN Secretary General can be viewed here. Bloomberg writer Shruti Date Singh, in an article from yesterday, provided a look at how oil prices are having an impact on the price of sugar, which is also used as a feedstock for ethanol production. The article stated that, “Sugar ended the week with its sharpest drop in a month because of a new wave of speculation that rising global production would overwhelm increased demand for the crop to make ethanol, after crude oil prices fell from a record high last week. “The International Sugar Organization said on Aug. 24 that the global sugar surplus would reach 10.8 million metric tons in the year ending Sept. 30, 2008, up from 10.3 million a year earlier. “The price of oil is down 2.8 percent from a record on Nov. 7, curbing demand for alternative fuels like ethanol made from sugar cane. And with respect to federal energy legislation, John M. Broder reported in today’s New York Times that, “When the Senate passed an energy bill in June, crude oil was trading near $65 a barrel, the highest price in a quarter-century. When the House acted six weeks later on markedly different legislation, oil had passed $70. “Then nothing happened. Oil prices continued to climb while members of Congress bickered among themselves and sniped at the White House. “Lately, the price of crude oil has flirted with $100 — it settled Monday at $94.62, down $1.70 — and some analysts have projected $4-a-gallon gasoline by spring. Lawmakers may finally be preparing to act, most likely on a less ambitious set of energy-saving measures than those passed by either house this summer. Reuters writer Laura MacInnis reported yesterday that, “Developing countries are deeply divided about how to advance troubled talks over a new global trade deal, and few ministers will attend a meeting this week meant to show their unity, diplomats said on Monday. “Brazil invited nearly 30 top officials from emerging nations to Geneva to discuss next steps for the six-year-old Doha round of World Trade Organisation (WTO) talks, which are mired in tensions between rich and poor countries. Dow Jones News writer Gerald Jeffris reported yesterday that, “Brazil’s president Luiz Inacio Lula da Silva on Monday said his country is interested in moving forward with the Doha round of World Trade Organization talks, not in blocking a deal, the Estado News Agency reported. “Lula made the declaration in a phone conversation with U.K. Prime Minister Gordon Brown, according to Brazilian Foreign Relations Minister Celso Amorim. And in a more general look at global agricultural trade and U.S. farm subsidies, Associated Press writer Garance Burke reported yesterday that, “Growing cotton has rarely been a more risky proposition than it is now, which is precisely why cotton farmer Frank Williams is planning to sow his fields with wheat. “From Williams’ California fields to the Texas plains, farmers are plowing under cotton – once the king of U.S. agriculture – to seed crops that make more money. “Cotton also has lost ground for another reason that became apparent last week as the Senate debated the 2007 farm bill: The U.S.’s cotton subsidy program is enmeshed in a global trade battle. The AP article stated that, “The current bill on the Senate floor leaves those programs virtually intact, despite the threat of further legal complaints and concerns that international sanctions ultimately could cause layoffs and patchy unemployment. Last week, the Bush administration threatened to veto the multibillion-dollar farm package wholesale, saying the Senate bill would impair negotiations with the WTO. With respect to U.S. cotton production, the article explained that, “This year, cotton acreage nationwide dropped 28%, hitting an 18-year low at 11.1 million acres, according to the U.S. Department of Agriculture. Acreage dropped by about 22% in Texas, the national leader, and by nearly 20% in California, which ranks seventh in domestic production.